Ready for another spook-a-licious Halloween creations? 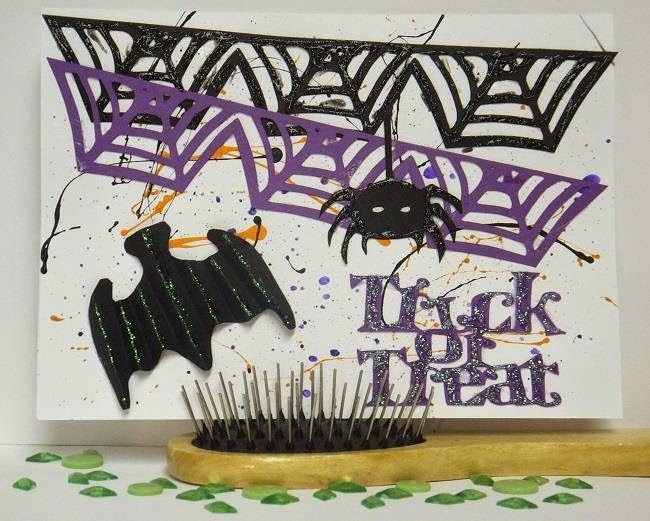 Today we have a fun card made by DT member Bev Code. And now I'll let her give you all the details in her own words. JnW Crafts is a small town, family run business that creates unique templates and embellishments from wood and acrylic mediums. The different mediums allow more options for you the consumer. And we all want more options, right? I am honoured to be on the DT and enjoy sharing projects made using these fun templates for either tracing, or using the positive and negative of the wood templates. This card started with background paint splatter, a Cricut cut sentiment, web borders, and a spider. I used the template to trace the bat. Then wanting it to have 3D dimension, I variegate folded it starting from the centre out the wings. Apply glue to the lower edge and apply to card. Just a touch of stickles on the bat and the card is done.Visit the store to view this and many other fabulous images in wood and acrylic.This bat template is available in the store.